If the previous winner of Australia's top motoring award forced a serious double-take, then the 2019 Wheels Car of the Year confirms you need to totally re-think your preconceptions about cars. 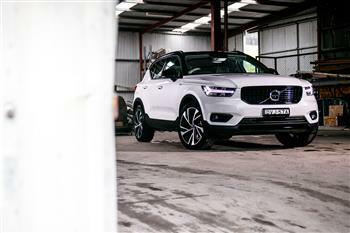 The world has changed and Swedish maker Volvo has completed its own stunning image makeover to go 'back to back', thanks to the outstanding XC40 SUV. Now in its 56th year, Wheels Car of the Year is the world's longest continuously running new car award and the benchmark for manufacturers and motorists alike. It was a tight contest at times, but the judges found the VOLVO XC40 (the leaner and more moderately priced sibling of last year's winner the XC60) out-pointed its opposition on all five key criteria on which the award is decided. "The name used to be a punchline, so there may never have been a more successful company turnaround than Volvo's recent form, as it's certainly no fluke," notes Wheels Editor Alex Inwood. "With the XC40 you won't find a more spacious premium SUV in its category and - in a world where we're often forced to pay an annoying premium to get what we want - even the entry level version will leave its new owner completely satisfied. "It is packed with plenty and, as our rigorous testing program proves, it delivers in all key areas. A most worthy winner and ultimate confirmation that the auto universe has truly shifted." Having finally broken the ice with the XC60 SUV last year, Volvo has continued its stellar form with the younger/leaner sibling XC40 taking the top prize in 2019. The XC40 is a five-door, five-seat small SUV with 4cylinder turbo engine, 8-speed auto transmission, and the various model offerings range from $44,990 to $55,990. It is a standout leader in its class. The 24 new car contenders, represented by 47 different model variants, were put through their paces at Ford's You Yangs Proving Ground in Victoria and assessed by Wheels' expert panel of judges. Contenders were then put through rigorous testing on the open road as well. Across a week and 10,000km of testing, the finalists were never judged against each other but against an established criteria that includes function, technology, efficiency, safety and value. The Volvo beat out an all SUV 'Top Three', which also included a stunning, all-electric offering from Jaguar and a compelling family transporter in the Subaru Forester. While Volvo may have reinvented itself (with thanks to significant investment from its now Chinese owners), its impeccable reputation for safety remains. The XC40 comes with seven airbags, and a slew of protective technology, including blind side monitoring and a system to automatically steer you away from a head-on crash. The small SUV segment, in which the XC40 plays, is one of the most popular and booming markets in the Aussie auto industry. In fact it's the fastest growing SUV segment in Australia, up 17.3 percent in 2018. Only one of the judges knows the outcome. In time-honoured tradition, judges give the magazine's editor their final choice on a piece of paper – and the victor of Australia's most prestigious motoring award is collated, and ultimately decided, in a nearby toilet … to be announced only in the magazine itself. The Wheels Car of the Year is the centrepiece announcement at the Australian Motoring Awards, which has also crowned the 4X4 of the Year, MOTOR magazine's Performance Car of the Year, and the WhichCar Style Award. Full details appear in the latest issue of Wheels magazine.